How do I extract data from response in Burp Suite Intruder? Already gone through How to perform custom response grep/extract in Burp Intruder?, but this does not solve my problem. While performing attack using Intruder I have used grep extract and obtained values in separate columns. What I want to achieve is extract that data in a separate text file with each row in new line. I know that burp supports saving whole response to a file, after which I can search using regex. But I have hundreds of response and it's time consuming. According to the official documentation you can choose which columns you want to save to the file. 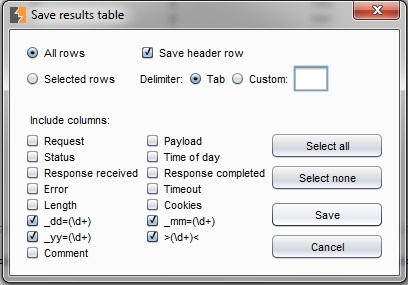 Results table - This is used to save the results table as a text file. You can choose to save all rows, or only selected rows. You can also select which columns to include, and the column delimiter. This function is useful for exporting the results into a spreadsheet for further analysis, or for saving a single column (such as data mined using the extract grep function) to be used as an input file for subsequent attacks or other tools. So you should click "Save"->"Results Table" to save the currently visible results table. To adjust the columns that are visible in the results table (and the ones that will be saved), click "Columns" in the menu and make sure only the columns that you want to export are selected. Step 3: Save in desired format by clicking on save. Not the answer you're looking for? Browse other questions tagged burp-suite or ask your own question. How to perform custom response grep/extract in Burp Intruder?